There is no doubt that Jay Ingram knows how to make a story dramatic, and he does so with all guns blazing in Fatal Flaws, the story of the discovery of the (probable) causes ofprion-based diseases kuru, scrapie, CJD and BSE. The first half or more of this book reads wonderfully well at a good pace, exploring the detective story behind the suspicions that these diseases were some how transmittable despite not appearing to involve bacteria or virus – in fact any sign of conventional infection. Ingram focuses on two fascinating areas: what prions are and how they could cause such terrible diseases, and the nature of scientific discovery, warts and all. He profitably spends plenty of time on the less salubrious aspects of academic rivalry and the vastly different approaches of some grandstanding scientists and other solid, behind the scenes workers. From the offset I thought this was a great book. I have a low tolerance for medical matters, but prions and the nature of their means of attack and transmission are so fascinating that this pushed any medical squeamishness out of the way, as did the biographical detail. After all these appear to be proteins with no DNA component that somehow manage to reproduce, running contrary to what could be regarded as a dogmatic aspect of biology. In a horrible way, prions and their ability to interfere with the way other proteins fold are things of wonder. Only one thing grated – Ingram insists on telling us over and over again what he is doing and how he is going about it. This is mildly irritating. Also the later part of the book, where he looks at the deer equivalent of BSE and goes through a whole set on chapters on brain diseases that are like prion-based diseases with no obvious prion contribution gets a little tedious and lacks all the storytelling and drive of the earlier section. 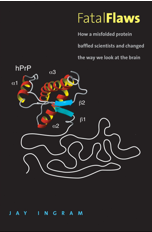 All in all, despite these minor failings it’s a gripping read on prions, kuru and BSE, and really gives food for thought on the way we go about science. Recommended.